HOLY FLYIN' FRYIN' PANS! Is that a robin I see? Out there in the garden? With snow still on the ground? MOUSES! Unfortunately, the robins are out and about, here in Nova Scotia. I feel really sorry for the little guys 'cause they must be starvin', for sure. We still have a couple of feet of snow and there isn't a worm to be found. With all this wonky winter weather most likely caused by global warming, the early bird can no longer get his or her worm. MOUSES! But speakin' of things that fly, did you hear 'bout the new Amazon drones bein' tested right here in Canada? Well not right here at my house or anythin' like that. In fact, they're testin' them on the other coast but up here in Canada, nonetheless. MOUSES! One day in the not-too-distant future, we'll be able to order somethin' from Amazon and have it delivered right to our doorstep in thirty minutes or less. That's right, they're sayin' that small items will be flown in by drone right to your kitty condo door. Talk about customer service! We're livin' in the future, for sure. You know, you expect stuff like that in science fiction and Harry Potter but in reality? Never thought I'd see the day. 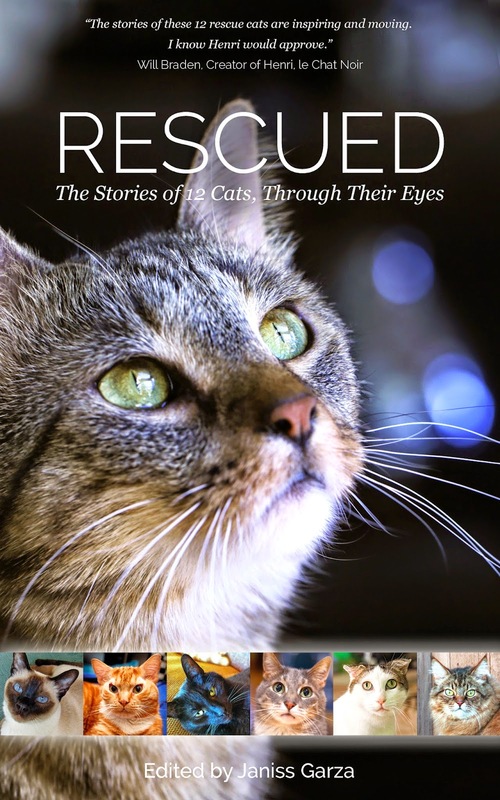 Imagine bein' able to order up a copy of Rescued: The Stories of 12 Cats, Through Their Eyes and with a little click here and a little click there, find that very same book sittin' on your doorstep, thirty minutes later. Wow. Currently, we have to wait at least twenty-four hours. And speakin' of Rescued: The Stories of 12 Cats, Through Their Eyes, do you have your copy as of yet? But back to the drones. I'm wonderin' if the peeps runnin' Amazon might be interested in usin' eggbeater teleportation technology with their new endeavour. It, too, is the technology of the future, for sure. MOUSES! You know, I'm just itchin' to go on another adventure. Itchin' and itchin' and ITCHIN'! What's that, Peepers? No, I do not have fleas. It's a different kind of itchin', you see. MOUSES! Don't tell the peep but word on the street is that Silver and Savvy and I have an upcoming adventure up our sleeves. Yup, tucked right up there in our sleeves. We're plannin' somethin' super big, for sure. Note to self: Buy a cat-sized sweater or somethin' with sleeves. MOUSES! And did you hear about my birthday? I'M GONNA BE TWELVE. It's true, exactly one week from today, I'll be turnin' the big one-two. I'm hopin' they'll be some nip. Of course, with my recently diagnosed medical condition, things here have been a little touch and go. For a while there, the peeps were wonderin' if I'd make it to my birthday. At my weigh-in last night, it was discovered that I've lost a little more weight and Peep #1 says I can't afford to lose even one more ounce. But she received some good news today. There's nothin' definite or anythin' but suffice it to say, there's a glimmer of hope shinin' in. Things are lookin' up, I do believe. One of the problems at paw has been gettin' an appropriate medication for my condition. There's stuff available in the United States which is bein' used quite successfully, too, but a kitty can't get his paws on it up here in Canada. The Canadian government can be a real stickler 'bout these things, you see. Not fair, really. Canadian kitties need medicine, too! This is just one more reason why I, Nerissa the Cat, should be appointed to the Canadian Senate. Once appointed, I'll make sure that appropriate rules and regulations are kept but that life-saving medicines are available to all. MOUSES! #Niss4Senate - Tell the Prime Minister, today! Seriously. Tweet him, call him up, write him a letter... He'll love hearin' from you, for sure. And speakin' of the Senate. Lots of Senate-related stuff is currently in the news but don't you worry, my friends. I, Nerissa the Cat, am watchin' like a hawk and compiling the facts. I'll have things to report, for sure. In fact, I'm feelin' a cheese-snackin' induced dream comin' on and I wouldn't be at all surprised to find myself bein' called in by the Royal Canadian Mouseland Police. And speakin' of cheese, there's more good news! Now that the peep understands exactly how my medicine works, I might be able to indulge in a little snackin'. Not too much but just a little somethin' to make my life worth livin', you know? Just a little nibble or two. There's just one thing more I feel the need to say. A little reminder of sorts. Bear with me, if you will. You ever notice how some peeps wanna be right 'bout stuff at all costs? That's right, they don't care what the cost as long as they're right. Basically, they're investin' in the wrong stuff and investin' in the wrong stuff almost always proves to be costly. MOUSES! Sometimes, peeps come up with a plan. The plan makes sense and the plan's goal, off on the horizon, is a good goal, for sure. So those peeps set their eyes on that goal, forging ahead. But then somewhere along the way, they encounter an obstacle or two and that path that was paved with only the best of intentions, becomes a little rocky. The path slowly bends and a corner is cut here and another is cut there. The goal is still off on the horizon and still very much in view and yet somehow, its importance becomes secondary to somethin' else. The peeps on the path start payin' more attention to the stones paving the path than the destination, itself. And that path becomes their goal. And because of all the hard work put into pavin' the path, the peeps wanna prove that pavin' it was worthwhile. They've invested their hearts and souls into that path and its success becomes the most important thing of all and eventually, there's nothin' else in sight. To admit that the path isn't leadin' them to where they originally wanted to be led, would be the same as admittin' defeat. So it's important to remember that sometimes things just don't work out as planned. Even with the best of intentions, things can fail. And when somethin' fails, there's nothin' wrong with admitting that failure. In fact, admitting such things is one of the most courageous things one can ever do. There's importance in bein' earnest. In bein' truthful to oneself and everyone else. Being right at all costs is not bein' earnest at all. In other words, when things don't work out as planned, ADMIT IT. Admit it to yourself and everyone else. Accept responsibility for whatever happened and start repairing any damages so that once more, your original goal can come back into sight. Of course, this advice applies mainly to peeps and not to us cats 'cause cats are almost always right 'cause you know, we're cats. It's in our nature to be right, you see. And on the rare occasion when we might happen to be wrong, we stop whatever we're doin' and start washin' our tails, remindin' the world that we didn't go adrift at all but rather, simply changed our minds, mid-stream. Once again I must say, MOUSES! Hey Nerissa, the stuff about the birds, they are saying you can put out some dry cat food, or moistened dry cat food, or even canned food (nows a good time to ditch any of the cat food in your house you don't like LOL). You can put out Mash too, but please not bread as they might choke on that. Hope you get your health sorted out soon. Hugs from me and Purrrrs from all your feline friends here. Nerissa if I I lived in Canada I'd vote for you for Senate. You are one smart kitty. How cool that Anjellicle Cats Rescue benefits from this month's sales of Rescued! They do so much good work. Poor birds can't get at much with all this stinkin snow. And yep, have to accept indeed, take he blame and move on. Faster and easier most times than trying to lie away or run away. Well I think that you can get the meds is a bunch or robin poop pal. Surely all of us can figure out a way to overcome that crazy thing. You simply must get better, period! We all love you Nissy. We purr that things are looking up for you Nissy! We hope you start gaining weight as well. You need to be healthy so you can get in the senate..
Maybe some cheese will do, say some Camembert ? Another reason you need to be in the senate :? That's interesting - I didn't know birds could eat kibble, as your commenter Sue mentioned. Of course, if we left any sitting around here, we'd just get stray cats, some possums and a raccoon or two! Weird or what. And wes worried about all the poor animals that will starves because of all the snow. So furry sad. Say you saw a Robin?? Fur reel??? All mee has seen iss Sparrowss an the usual suspect Pigeonss. Xcept fur big snow piless thee ground snow is gone here but Spring reefusess to show up! PICKERELL thiss iss furustratin!! We hopes you are feeling better soon Nerissa. We is sending our biggest purrs that you gets the medicine you need. Our Nova Scotia friends told us there's more snow up there again....stay warm and safe. We sure hope you can get what you need to stay super HEALTHY. I am purring you can get the medicine to make you better Nissy. It is the same here. The gel for hyperthyroidism only became available in the UK in October, and before that it could only be imported on a special license. After all that, it didn't work for me anyway. Hey! Maybe they can send your meds by drone! So you're working on another adventure? That's a good sign that you're feeling perky again Nissy....glad to hear it. Sorry you're having issues getting you rmedications up there in Canada-land though. That's not good.....you DO need to be in a government position so you can FIX that! We still have lots of snow here in Ontario too, but the weather guys keep promising that it will warm up soon!! Oh, it's so hard to admit when things go wrong. I usually blame it on MomFOD. I'll work on not doing that. Maybe I should blame DadFOD instead. Hope you're feeling good! - Crepes. We hope that you somehow get that medication you need, Nissy. dood...we canna wait for de late est add venture with ewe, savvy & silver....purrhaps sage two !! ???? We hope you get your medication and it works for you Nissy. It surprised us that the vet didn't have the sort of medicine you needed at their practice - even in the UK our vet is able to give (sorry sell) the medication to Mum with full instructions on when and how much to give us. The also ring the next day to see if we are OK.
My mum has a blue tongue lizard at work (he lives outside in the courtyard) who eats cat kibble too! We hope things continue to look up for you, Nerissa, especially with CHEESE! Good advice and boy, we can't wait until we can get treats and nip in 30 minutes after ordering! Hi Nerissa!!!! Hope you get your snacks now and hope your medicines are working. We got OUR book yesterday YEAH!!!!! In case we don't make it here next Wednesday, happy early Birthday my friend!!! Side note, we have had a bit of a blog site change, we are posting at martythemanx2.wordpress.com now. Birds! Did somebody say birds? I think for sure you should be in the Senate, Nissy! Me and The Staff person aka The Affiliate Typist are allowing ourselves to be more than a little bit hopeful that you not only make it to your next birthday but many many more to come! :) xox Oh, and that thing about the path was BRILLIANT!! Oh, Nissy! We would certainly support your campaign to be a Senator, if we lived in Canada! And why stop there? You should definitely be Purr-ime Minister! As for the other thing - we have our paws crossed for you, that you can get the meds you need and that they prove effective. Purr-ayers and best wishes from Trixie, Caspurr, Shimshi and Shimona (aka Mummy).